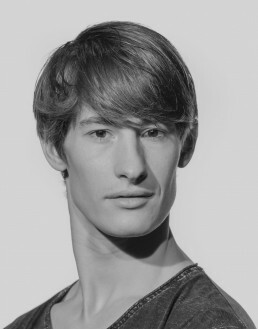 British born, Alexander Jones is a Principal dancer with Ballett Zürich and trained at London’s Royal Ballet School. He won the gold medal as well as receiving the Dame Ninette de Valois Prize at the Adelaine Genée Competition in 2004. Before joining Ballett Zürich Alexander was a Principal with the Stuttgart Ballet. He appeared as a guest artist at the Prix de Lausanne in 2014 where he performed Grand Pas de Deux with Lauren Cuthbertson (Principal from the Royal Ballet, London) by Christian Spuck. With Stuttgart Ballett his repertoire includes the roles of Armand Duval in The Lady of the Camilias (John Neumeier), Romeo in Romeo and Juliet (John Cranko), the man in The Song of the Earth (Kenneth McMillan), the title roles in Onegin (John Cranko) and Hamlet (Kevin O’Day) and with Ballett Zürich, Prince Siegfied in Swan Lake (Alexei Ratmansky), Prince Albrecht in Giselle (Patrice Bart) Romeo in Romeo and Juliet, Nathanael in Der Sandmann and Alexej Karenin in Anna Karenina (Christian Spuck). Additionally, throughout his career he has been involved in numerous creations and Principal/Soloist roles in works by George Balanchine, Jerome Robins, Frederick Ashton, Peter Schaufuss, Glen Tetley, Maurice Béjart, Marcia Haydée, Hans Van Mahnen, William Forsythe, Wayne McGregor, Douglas Lee and Edward Clug.